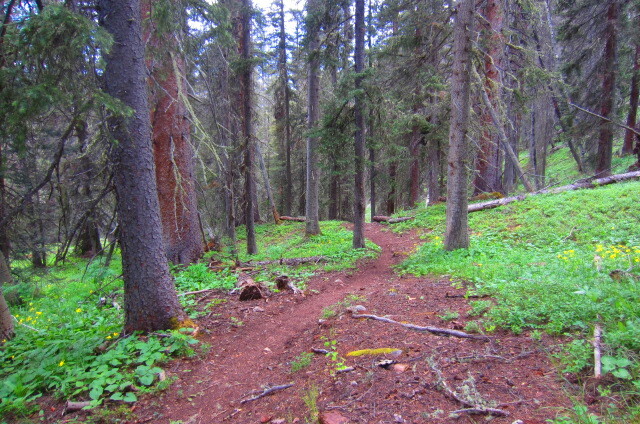 Often confused with the Engineer Mountain Trail, the Engine Creek Trail is a more technical trail on the west side of Engineer Mountain that runs through the trees near the bottom of the Engine Creek drainage. 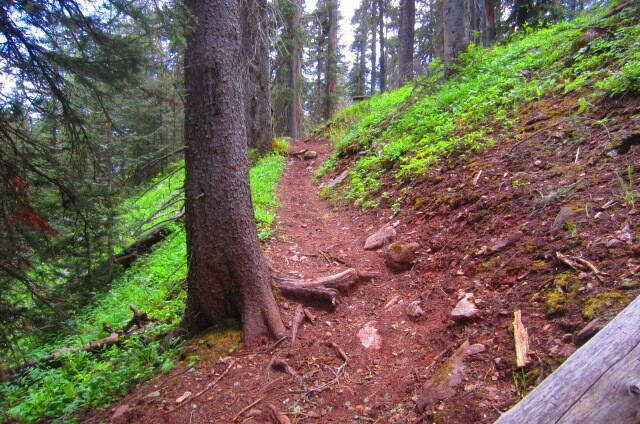 As an intermediate to advanced-level mountain-bike trail, all of the root gardens and short six-inch to one-foot drops off of water bars make this trail much more desirable as a descent from the Engineer Mountain Trail at the top. 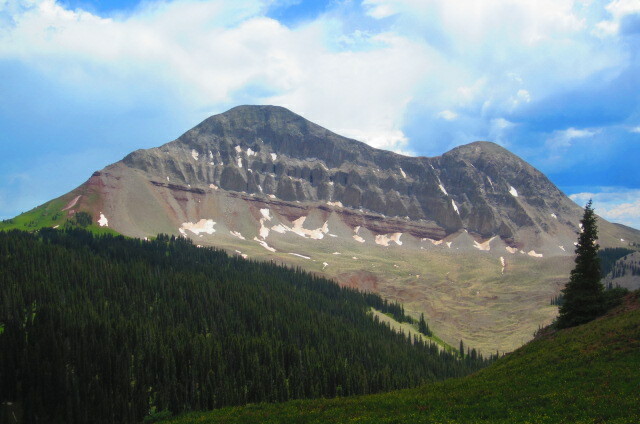 This epic view of the back side of Engineer Mountain will make your jaw drop. 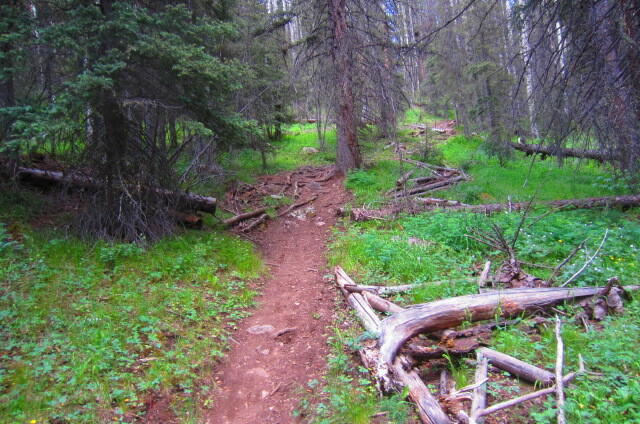 Engine Creek Trail was probably designed and built long before mountain biking existed, as it lacks any consistent flow to help riders keep their momentum on the descent. 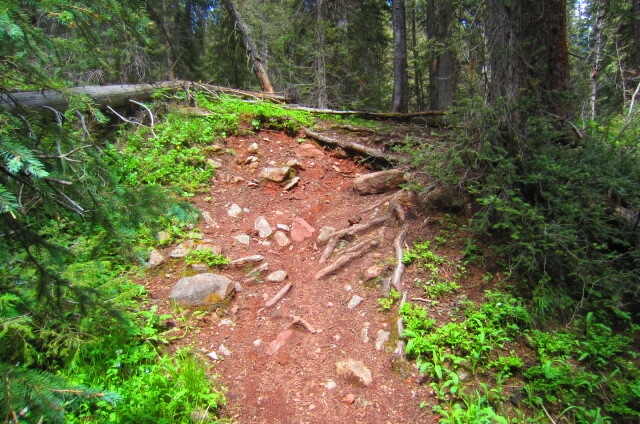 You’ll ride down some fun, challenging root gardens and rocky sections, go down into a sub-drainage crossing, and then find yourself hiking your bike out a little ways to the next short section of trail that’s rideable. I don’t know how well others rode this trail, but I found myself getting on and off of my bike a lot to hike out of little drainages feeding into Engine Creek. It had a very fragmented rhythm to its slope-grade consistency. 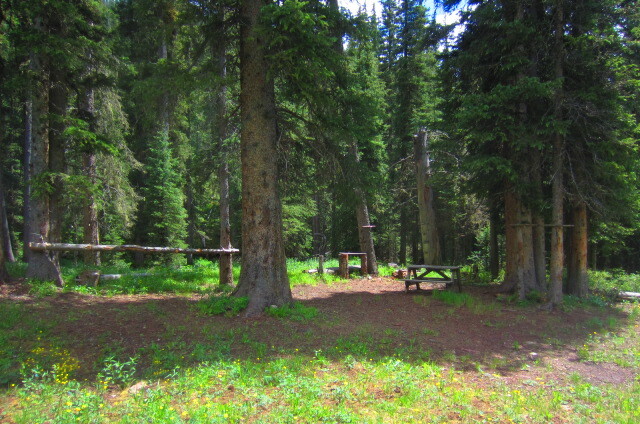 Engine Creek has two really sweet hunting camps, with one about midway up the trail, and the other at the bottom of the trail at the intersection with the Cascade Creek trail. 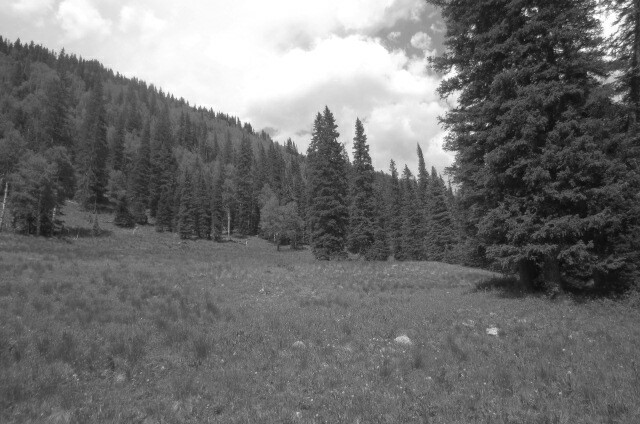 About half way down the Engine Creek Trail you’ll come to a big meadow where you’ll see this camp below it. 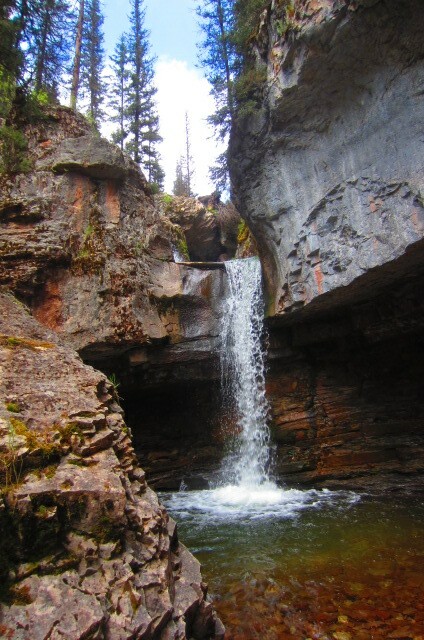 Accessing Engine Creek Trail can be done on a ride from Molas Pass to Cascade Creek, after first riding parts of the Colorado Trail and Engineer Mountain Trail. You can also ride there from Coal Bank Pass. 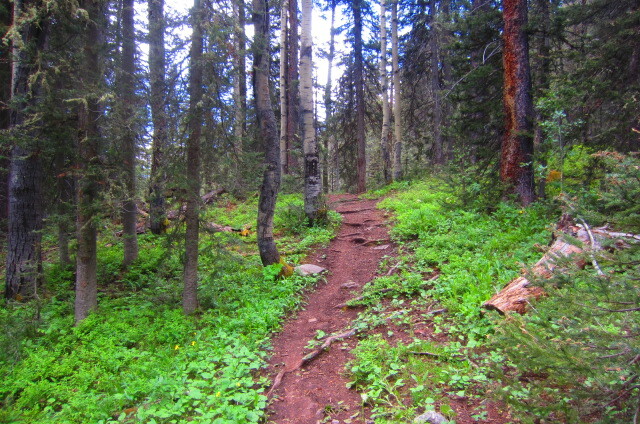 I got there from the Pass Trail that ascends 2.45 miles from Coal Bank Pass. 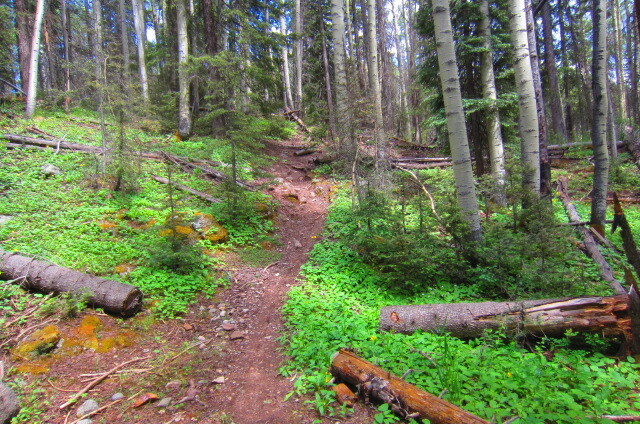 From Pass Trail, you turn off onto Engineer Mountain Trail and go north, northwest and then west for about 3.28 miles. 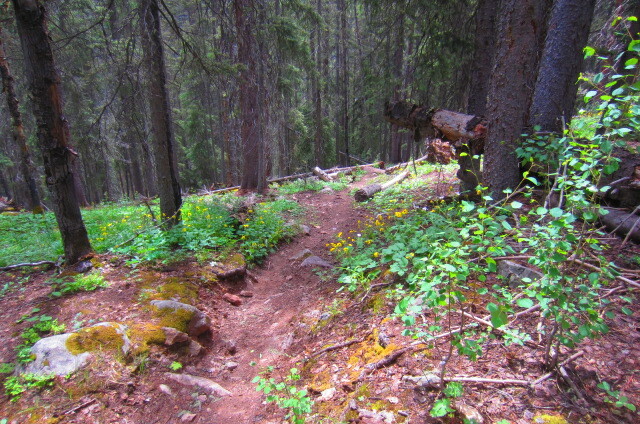 On the Pass Trail, you can expect some technical and rocky terrain, with many hike-a-bike sections, but also an equal amount that’s rideable. 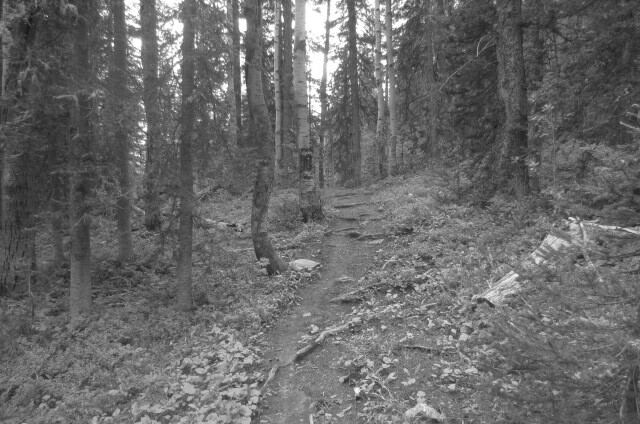 Expect to pass many hikers on the way up. 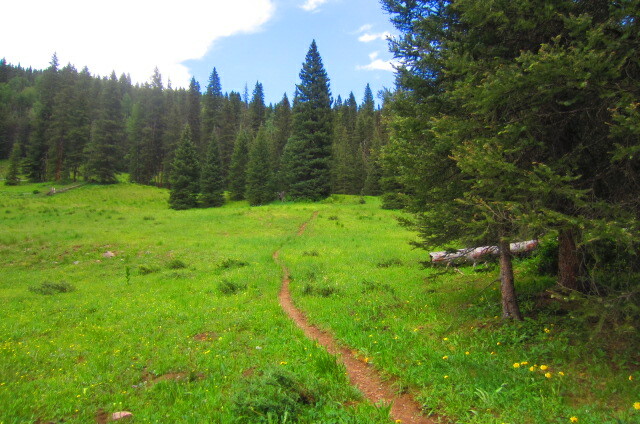 On the Engineer Mountain Trail, I encountered many rutted out sections that were nearly impossible to ride because my pedals would hit the sides of the rut. This meant that there were at leas a half-dozen hike-a-bike sections on this stretch alone. 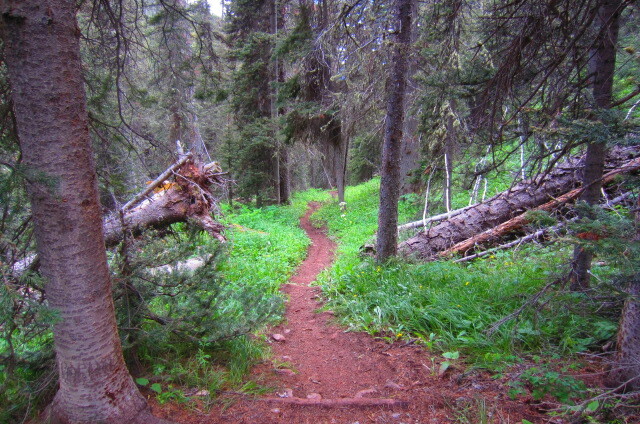 The turnoff to Engine Creek Trail is marked with a wooden sign that’s easy to spot. 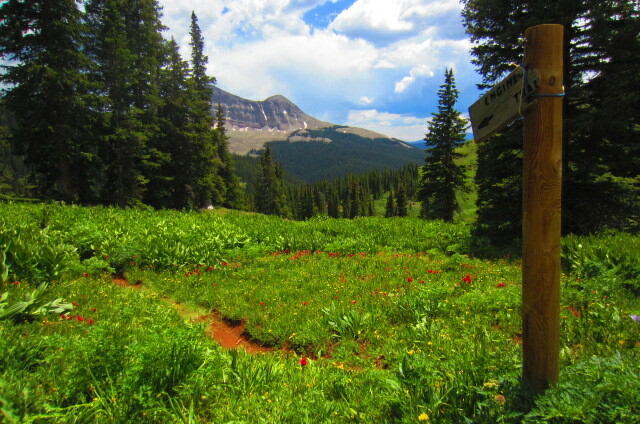 At the top of Engine Creek Trail you’ll see this sign post. 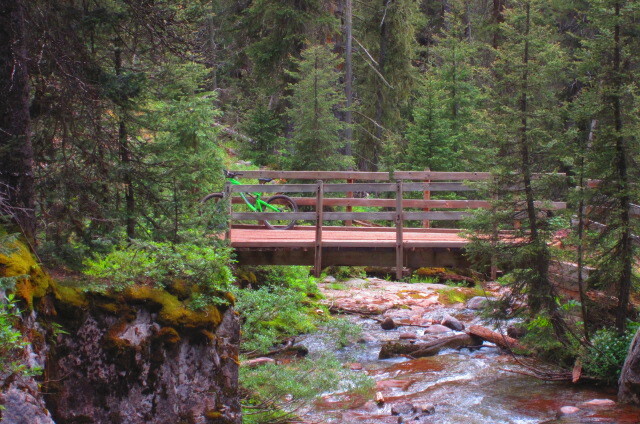 After riding down Engine Creek Trail, you’ll intersect the Cascade Creek Trail. 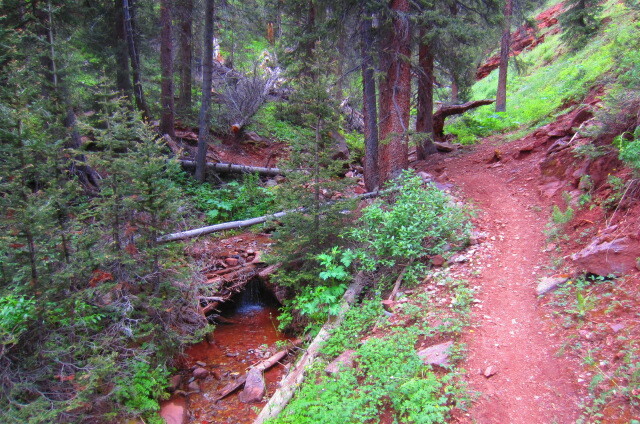 It lacks any real flow for mountain bikes, as well. You’ll ride for a hundred, maybe a couple hundred feet before going down into a little draw where you’ll have to hike your bike out of. Instead of the trail contouring with the topography, it takes straighter lines coming out of the draws that go over rock gardens that totally kill any momentum that you might have had to stay on your bike. The highlight of the Cascade Creek Trail is a bridge with a bunch of waterfalls above it that you could stop to check out or even swim around under the falls if you wanted to. 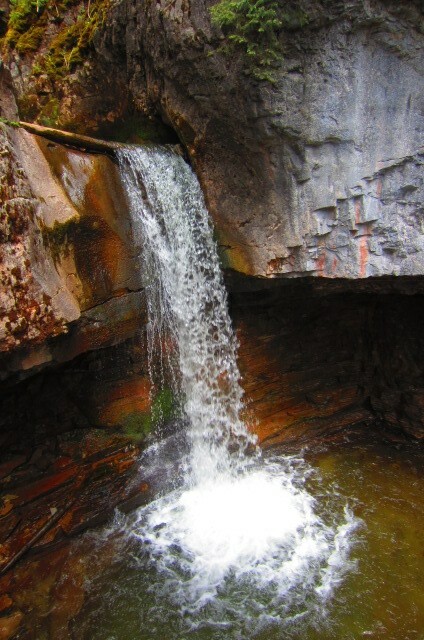 This is the water fall along Cascade Creek Trail above the bridge. Eventually you’ll come to the Cascade Creek Forest Service access road, which is a lot faster, and a more consistent grade to help you keep your speed on while you pass by some historic log cabins on your way down towards the Cascade Creek parking lot by the hairpin turn on US Highway 550. 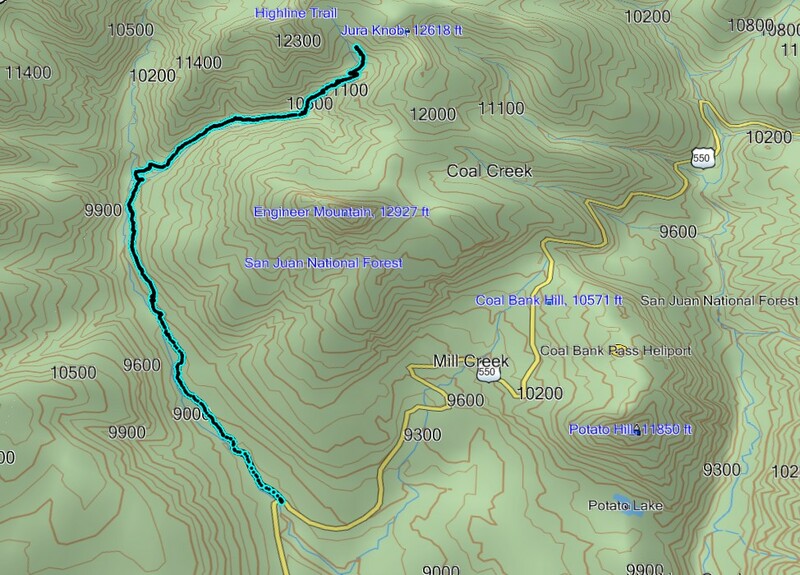 Engine Creek Trail is the black trail that’s highlighted in blue.